After a few weeks of anticipation, my Chromecast arrived yesterday. It was an impulse buy, but for $35 (plus shipping and tax, so around $40), minus the $23 of Netflix credit, it was worth a few bucks just to try out. I already have a Roku, which takes care of most of my needs (Netflix, Amazon, and Plex pretty much have me covered) but I figured if nothing else, Chromecast would be an easy way to show photos from my computer on my TV. Setup is easy and fast. Casting from a Chromebook is easy, it even worked on my older Chromebook which is not officially supported. We had lots of fun exploring Google Maps with street view on the TV via the Chromebook. Casting YouTube videos works great – the quality was fine and controlling the video from my iPhone or Chromebook was easy. Casting from the iPhone YouTube app is easy. Can’t cast from Google apps on iPhone – To cast from YouTube, you have to go the YouTube app. From my iPhone, I tried to cast a YouTube video that was posted in Google+, but couldn’t. The only way I can cast YouTube from my iPhone is via the YouTube app. Casting from Google+ should be a no-brainer, but isn’t currently supported. Video quality is limited to 720p. Netflix is slow – videos take a long time to start playing, a surprisingly long time. Some issues when switching from Netflix to other apps on the iPhone. I started a Netflix video on my phone and sent it Chromecast. I then switched my iPhone to another app. The Netflix app locked up and lost all control of the video. The video continued to play, but I couldn’t control it. I shutdown my phone, and the video continued to play. I had to go to the Chromebook and start casting from it to get Netflix to stop. The setup instructions tell you to plug the Chromecast into your TV, but I plugged it into an HDMI port on my Yamaha receiver. It works fine in my receiver. Connecting the AC adapter was easier for me than using a USB port, mainly because the receiver doesn’t have a rear USB port. The instructions actually recommend using AC power. Physical install was quick, and easy. The setup was also extremely simple. I opted to use a Chromebook. I had to install the Chromecast extension, which took maybe a minute, after that it was only a few clicks and I was set. The most time consuming part was entering my WiFi password. After the physical install, it took maybe three minutes before I was casting from my Chromebook to my TV. Once I was up and running with the Chromebook, I went to my Windows 7 desktop to set it up. As it turns out, that went really quickly, but not for good reasons. Chromecast requires a WiFi connection. I downloaded the software, but setup failed because my desktop uses a wired connection. It’s on the same network as the Chromecast, but the Chromecast software tries to find a WiFi connection and completely ignores wired connections. That’s absurd. There is no reason any device on my network with a Chrome browser shouldn’t be able use Chromecast. In my opinion, this is a serious limitation. A lot of people have home theater PCs or Mac Minis, but if they are using a wired connection (which I assume a lot of people do) then you’re out of luck with Chromecast. It’s worth the $35. No question. There are some serious issues, in my opinion, but it’s worth the money. I won’t use it to watch Netflix because the Roku offers a much better experience, including video quality and speed. The ability to display YouTube is worth the $17 (net cost) I spent on the device. 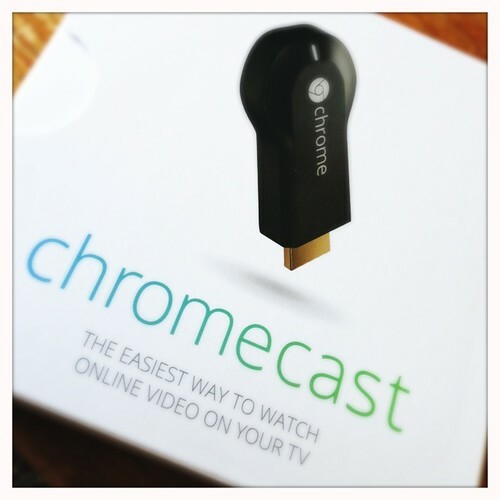 If you already have a Roku or AppleTV, you probably don’t need a Chromecast. Chromecast would be great for second or third TVs, but lack of 1080p support means you won’t want to use it for your main streaming device. I do like having the ability to cast from the Chromebook. That is a feature we will use, as is the ability to show YouTube videos on our TV. I just wish I could cast any YouTube video posted on any site. I am seriously disappointed by the lack of support for wired devices. One of the reasons I got the Chromecast was to show pictures that reside on my desktop. I can still use Plex for this, but would have preferred using the Chrome browser. I have certainly hit the ground running this year, at least in terms of photography. I decided to attempt the 2009 Photo Challenge so I’ve been taking a lot of photos. I’ve only missed one day so far, which means I’ve posted 34 photos for the challenge alone. I’ve also posted about 40+ other photos to Zooomr and Flickr. That has to be one my best months ever with about 75 photos in the month. I’ve also been very pleased with the quality of the shots I’ve been posting, and several have received a lot of faves and views. While I’d like to think I’m growing as a photographer, I’m certain the 2009 Challenge has helped me improve. In fact, a friend is buying prints of three shots taken specifically for the 2009 Challenge. That will be my first photography sale. I’m also contributing a photo to a fund raising auction for my kids’ school later this month. One final thing, I want to give a little promotion to the PhotoNetCast podcast. I’ve only recently started listening to this and have really enjoyed it. It’s entertaining and informative. I know everyone listens to TWIP, but you should also listen to PhotoNetCast. Really. This past weekend I said goodbye to my 1982 Toyota pickup. It’s just a beat up old truck, but I owned it for 13 years, significantly longer than any other vehicle. It was a good truck that served me well for many years. In September when the registration was due, I took it to get the bi-annual smog certification. I had my doubts about whether or not it would pass because two years before it had barely passed. Sure enough, it failed. I applied for repair assistance and was granted up to $500 for emission related repairs from the California Bureau of Automotive Repair (BAR). I took it to a shop, which said it needed a lot more than $500 dollars and a lot of non-emissions related repairs. Essentially, the cost of repairs was a lot more than the truck was worth. The BAR has a program that pays people to junk old cars that can’t pass smog. Because of pollution, the state is trying to get old cars off the road. The program encourages people to get polluting vehicles off the road by giving them more money than the car is worth (at least in my case). I rarely drove the truck and I had felt guilty about driving after it barely passed the smog test two years ago. It was a work truck that cost me more in insurance, smog, and registration in a year than the truck was worth and since the state was willing to give me money to junk it, I applied for the retirement program in November. Last Friday I drove it to the junk yard and they gave me my “vehicle retirement” check right there on the spot. It was a nice chunk of money for such an old vehicle, especially sense I don’t have to insure it anymore. The markings on the truck are required by BAR. Junk yards are prohibited from selling the truck or any parts, so they mark all the body panels, and even the rear view mirrors. There wasn’t much usable on my truck. The passenger side of the cab had been partially caved in by a tree branch about 5 years ago. Some home body shop repair with a sledge hammer got the door open after that incident, but it still had to be slammed shut. The left front fender was a brown because I had to replace it after a small fender-bender. Every body panel had a dent of some kind. The truck is probably a smashed lump of plastic and metal by now. I’ll miss my old truck, it was good to have around, but I also know it’s better that older cars be taken off the road. What a busy week it’s been. I haven’t had much time for photos or blogging. I did grab this shot on Halloween before the trick-or-treat madness started. I don’t bike much these days, but really want to get started again. I seem to always hurt myself when I try to exercise, but hopefully I can get back into it soon. I actually took this the morning we headed out for Yosemite, but it got lost in all pictures of Half Dome and El Capitan. I was putting the bike rack on the car and saw the steam rising from the fence, filtering the the sunlight. I ran inside and grabbed by camera to take some pictures. It was actually a really wet morning. There had been a heavy dew that night, so everything was really wet, and cold. The sun had only been up a little while, but was warming the fence. The steam didn’t last long and it was really cool to watch. I just wanted to capture that moment. One of those things that make you stop and savor the moment. I went into the little town of Penngrove for lunch yesterday and stopped by the park to take pictures. The park is one of the few with old, metal playground equipment, the kind all parks had when I was a kid. We’ve taken the kids there a few times, and they always have fun. It’s not a fancy, shinny new park, but it has a lot of heart and character. You can easily imagine generations of kids playing there. I can easily picture kids from any time in the last 60 years swinging and sliding and laughing here. While the new playground equipment offers twisty slides, climbing walls, and rubber coated steps, they just lack character. he’s taking black and white photography class at the local Junior College and using his parents old 35mm film camera. I blogged about the photography I did back in college using my T70 and even posted a picture of my camera on Zooomr. He probably wasn’t born when I got my camera, and said he thought his parents got his camera before he was born. My old T70 is broken and had been stored in the attic until a couple of weeks ago when I decided to use my 50mm lens for Poor Man’s Macro shots. I had also had the 75-200mm lens pictured here. Since I wasn’t using it anymore I offered it to the him for free. He was extremely grateful and shocked. This evening I dropped the lens off to him at work (he works in grocery store that I had to go to anyway). He still couldn’t quite believe his good fortune. I was happy to give him the lens. It was doing me no good and he will put it to good use. He seems to really enjoy photography, and is wondering if he can make a career of it. Maybe someday he’ll be a famous photographer and I can say I helped him get started. I was also touched by his response. He was genuinely thankful and excited. A lot of kids I’ve seen around have a sense off entitlement, like the world owes them something. Not this young man. He’s working hard, going to college, and loves photography. So here’s to Steven, a budding young photographer using recycled equipment to shoot black and white film. I can’t wait to see his work. Yesterday I went out to Point Bonita in the Golden Gate National Recreation Area with my family to hike around and shoot some pictures. We followed that up with dinner at Joe’s Taco Lounge in Mill Valley. Joe’s is the best Taco Lounge around. To this day I have not found a better chicken burrito. The decor of the place really makes the experience. The walls are lined with hot sauce, as shown in the image above. There’s also plenty of religious artwork and icons as well. It’s only a couple of miles of 101, so stop by if you get the chance. Tonight I plan on getting up to shoot the eclipse, but have splitting headache at the moment, so I’m playing it by ear. Last weekend my family went out and picked some blackberries, so I made a pie. It was a good pie, especially with vanilla ice cream. It was decent year for blackberries, even with the low rainfall. The berries weren’t as big as I’ve seen them in the past, but were sweet. Picking blackberries is somewhat of a labor of love. It takes a quite a while to get enough berries for a pie and your hands end up stained and cut from the thorns. But then, there’s nothing like a warm blackberry pie. Blackberry picking is somewhat of a ritual for us every year. We make a point of picking as much as we can, but as the years go by, summer gets busier so we don’t get out to pick as much as we used to. But we do get fresh berries every year. I’m hoping to get out again soon to pick more berries and make another pie. We’ll see. I saw this flag by the side of the road as I drove to work last week. I didn’t have my camera, and figured it would be gone the next time I drove by. It wasn’t. It laid there for several days. I finally stopped to take a picture and collect the flag. I don’t know how long it had been there, but it was pretty battered and dirty. It had obviously been there a while. I was surprised to see it there to begin with, and even more surprised it stayed for so long next to a busy road. I don’t consider myself overly patriotic, but I still thought someone should have picked up the flag. It is a symbol of our country, and whether or not you agree with the policies of our current administration, I think most Americans at least have a fundamental respect for the ideals of our Constitution and the Bill of Rights (even if our current Administration doesn’t seem to respect either) and what the flag represents. It does not represent policy or a political party or misguided trust in a power addled president. It represents hope and freedom and opportunity and justice for all people – regardless of where they come from, what they believe, or who they fall in love with. I thought it incredibly sad and ironic that hundreds of people drove by this flag, tossed by the side of the road along with fast food containers and cigarette butts, but no one thought to pick it up. I wonder how many of these people think it a crime to burn the flag as form of expression. I guess if people don’t care enough to stop and pick up a flag, then they can’t be expected to speak up for what the flag represents. I’m not even sure I should have taken a picture, but that’s what I do, and the scene touched me. People fought and died for this country, then others fought and died for rights everyone deserves. Now, in our modern times, people can’t even show a small sign of respect. It makes me sad. I hope that shows in the shot. You are currently browsing the archives for the Life category.